Sharda School of pharmacy, Greater Noida, Uttar Pradesh, 201306, INDIA. Raj Kumar Goel Institute of Technology (Pharmacy), Ghaziabad, 201004 Ex Dean of Jamia Hamdard, New Delhi, 110062, INDIA. 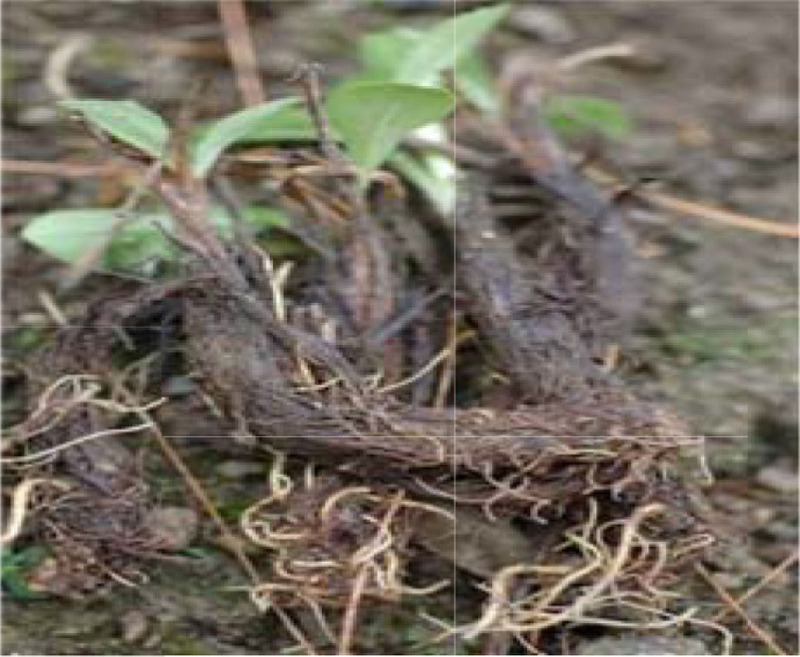 The Rhizomes of Nardostachys jatamansi D.C (Family Valerianceae) were collected from Haridwar, Uttarakhand. To identify the various volatile constituents of Nardostachys jatamansi D. C. Rhizomes and evaluation of antimicrobial activity. The essential oil was collected by hydro distillation and analyzed by Gas Chromatography (GC) and Gas Chromatography-Mass Spectroscopy (GC- MS). Volatile oil constituents, antimicrobial potential of Nardostachys jatamansi D. C. Rhizomes have been studied using different concentrations of the volatile oil against some micro-organisms. A total of 10 compounds were identified from their fragmentation pattern. The Identified compounds were Calarene (20.4%), Vardiflorene (12.3%), α- Panasinsen (9.7%), α- Santalene (4.6%), γ-Himachelene (17.1%), Jatamansone (7%), Ionol 4 (9.9%), 2,2,7,7- Tetramethyl tricyclo[6,2,1,0 (1,6)] undec-4-ene 3-one (1.7%), Epiglobulol (1.9%) and Resibufogenin (8.4%). Among them major constituents characterized was Calarene (20.4 %) and followed by γ-Himachelene (17.1%) and Vardiflorene (12.3 %). The volatile oil showed significant activity against all tested microorganisms. The maximum antibacterial activity was shown with 1%v/v of volatile oil on Staphylococcus aureus (12.8 mm) followed by Escherichia coli (12.4 mm), whereas maximum anti-fungal activity was shown by 1% v/v of volatile oil on Candida albicans (12.3 mm) followed by Aspergillus niger (11.9 mm). All identified constituents showed antibacterial activity and antifungal activity. Thus, the constituents should be further identified and analyzed by other spectrosopical techniques. The air-dried Rhizomes of N. jatamansi were obtained from Haridwar, Uttrakhand, India. The plant material was identified by Dr. Sunita Garg of NISCAIR, New Delhi and the voucher specimen was submitted their for future reference Ref.No. NISCAIR/ RHMD/ Consult/ 2015/ 2855-48-3. The air-dried Rhizomes of Nardostachys jatamansi (500 g.) were hydro-distilled according to the method recommended in British Pharmacopoeia, 2009 Figure 4.13 The light pale-yellow oil so obtained was dried over anhydrous sodium sulphate and stored at 4°C in the dark. The yield was 2% based on fresh weight of sample. Analytical GC was carried out on a Varian 3300 gas chromatograph fitted with a silicon DB-I capillary column (30m×0.25 m), film thickness 0.25µm., carrier gas Nitrogen, flow rate 1.5ml/min., split mode, temperature programmed 80-250°C at 4°C/min. Injector temperature and detector temperature were 250°C and 300°C respectively. Detector used was FID. Injection volume for all samples was 0.1 μl. Analytical GC-MS was carried out on a QP2000 instrument at 70 eV and 250°C. GC column Ulbon HR -1 fused silica capillary 0.25 mm × 50 m with film thickness 0.25μ. The initial temperature was 100 °C for 6 min. and then heated at a rate of 10°C per min to 250°C. Carrier gas Helium, flow rate 2ml/min., detector used was FID. The volatile components were identified by comparing their retention indices of GC chromatograph with those of literature. Further identification was done by GC-MS. 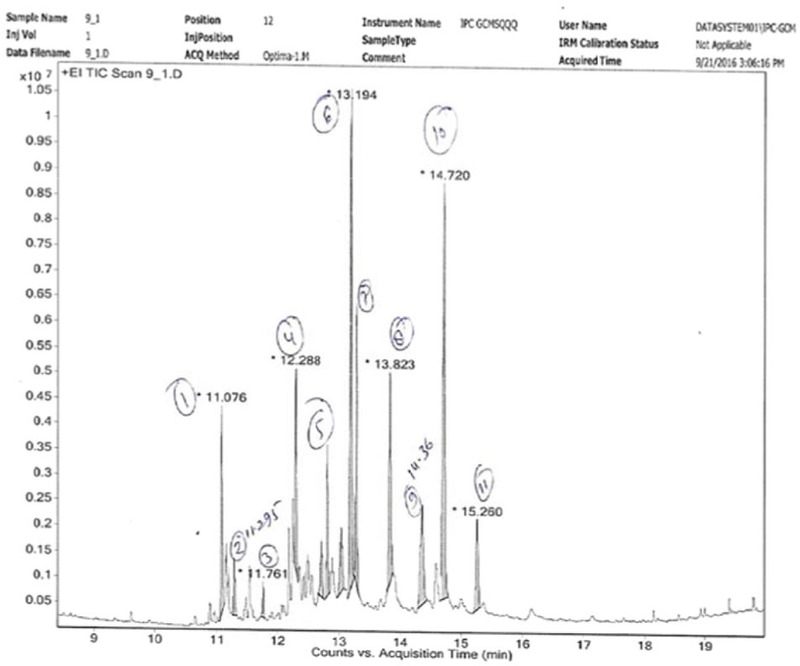 The fragmentation patterns of mass spectra were compared with those of the spectrometer data base using the NBS 54 AL and Wiley L-built libraries and with those reported in the literature.14,15,16,17,18,19,20 Many constituents were identified by comparing their retention indices with those of authentic standards available in the author’s laboratory (Table 1 and 2). The volatile oil (0.1%v/v, 0.5 %v/v, 1%v/v) were dissolved in dimethyl sulfoxide (DMSO) for anti-microbial activity. Chloramphenicol and Ketoconazole were used as standard solutions for comparison of anti-bacterial and anti-fungal activities. Both the standard drugs were taken in DMSO. The concentration of both standard drugs solution was 10 mg. / ml. The antimicrobial activities of volatile oil and dried alcoholic extract of dried Rhizomes of N. jatamansi were performed in the Department of Microbiology, School of Pharmacy, Sharda University, Greater Noida. The identification of microbial strains was based on morphological, cultural and biochemical tests. The in-vitro antimicrobial activity of various oil concentrations of the N. jatamansi Rhizomes were studied by the cup plate method.21,22,23 Against various microorganisms mentioned in the (Table 3 and Figure 3). Chloramphenicol and Ketoconazole were used as standard and the activity of each concentration was compared with corresponding concentration of standard drugs. The plates were incubated at 37 ± 2 °C for antibacterial activity and 25 ± 2°C for anti-fungal activity, after 48 h of incubation. The Petri dishes were taken out from the incubator and the anti-microbial activity of different concentrations of oil of N. jatamansi Rhizomes were compared by measuring the diameter of the zone of inhibition (Tables 3 and Figure 3). The control DMSO showed no inhibition of growth, while all the concentration of oil were effective against E. coli and S.aureus when compared with chloramphenicol and Ketoconazole. The maximum activity was observed with 1% v/v concentration of volatile oil of N. jatamansi Rhizomes. All the readings were taken in triplicate and statistical analysis were conducted using one-way analyses of variance (ANOVA). The results were represented as means of triplicate readings ± standard deviations (SD). P values < 0.05 were considered significant. The volatile constituents have been identified successfully by using GC and GC- MS techniques. The essential oil obtained from N. Jatamansi roots is slightly viscous and pale yellowish green with strong odour. The name of volatile constituent, percentage (%), retention index (RI), molecular formula, molecular weight and mass fragmentation index are given in Table 1 and 2 respectively. For antibacterial activity Test Organism i.e. Staphylococcus aureus, Escherichia coli, Candida albicans and Asperigillus niger, zone of inhibition (mm) for three different concentration of volatile oil i.e. 0.1%, 0.5% and 1.0% and two standard drugs i.e. Chloramphenicol and Ketoconazole is given in Table 3 and represented graphically in Figure 3. Molecular structures and GC-MS spectra for the identified constituents are shown in Figure 1 and 2 respectively. The 10 Identified compounds were Calarene (20.4%), Vardiflorene (12.3%), α- Panasinsen (9.7%), α- Santalene (4.6%), γ-Himachelene (17.1%), Jatamansone (7%), Ionol 4 (9.9%), 2,2,7,7- Tetramethyl tricyclo [6,2,1,0 (1,6)] undec-4-ene 3-one (1.7%), Epiglobulol (1.9%) and Resibufogenin (8.4%). The antibacterial activity observed was summarized in Table 3. The Volatile oil concentrations 0.1%, 0.5% and 1% v/v were found to be effective against Staphylococcus aureus and Escherichia coli at inhibition zone of about 12.8 mm and 12.4 mm respectively which are comparable with Chloramphenicol having concentration of 0.1mg/ml. The anti-fungal activity observed was summarized in Table 3. The volatile oil concentrations 0.1%, 0.5% and 1% v/v of volatile oil were found to be effective against Candida albicans and Aspergillus niger at inhibition zone of about 12.3 mm and 11.9 mm respectively which are comparable with Ketoconazole having concentration of 0.1mg/ml. Recently many volatile oils were found to be useful in the treatment of various diseases. The GC and GC-MS analytical techniques were very useful technique in qualitative and quantitative estimation of volatile constituents. The present aim of the study is to identify various volatile constituents and to evaluate their antimicrobial activity. The % yield of volatile oil observed is 0.5 %. Seven Sesquiterpenes (70%) were found, out of which five were hydrocarbons i.e. Calarene (20.4%), Vardiflorene (12.3%), α- Panasinsen (9.7%), α-Santalene (4.6%), γ-Himachelene (17.1%), one is ketonic i.e. Jatamansone (7%) and one is alcoholic i.e. Epiglobulol (1.9%); one Ttriterpene (10%) is observed i.e. Resibufogenin (8.4%); among others two (20%) were found i.e Ionol 4 (9.9%), 2,2,7,7- Tetramethyl tricyclo[6,2,1,0 (1,6)]undec-4-ene 3-one (1.7%) (Table 1 and 2). Antimicrobial activities of different concentrations of volatile oil of N. jatamansi Rhizomes obtained from Dist. Haridwar, Uttrakhand, India (Table 3). The maximum antibacterial activity was shown with 1%v/v of volatile oil of jatamansi Rhizomes on Staphylococcus aureus (12.8 mm) followed by Escherichia coli (12.4 mm), whereas maximum anti-fungal activity was shown by 1% v/v of volatile oil on Candida albicans (12.3 mm) followed by Aspergillus niger (11.9 mm). Molecular Structures of Volatile Constituents of Nardostachys jatamansi (Rhizomes). GC-MS Spectra of Nardostachys jatamansi Volatile oil. 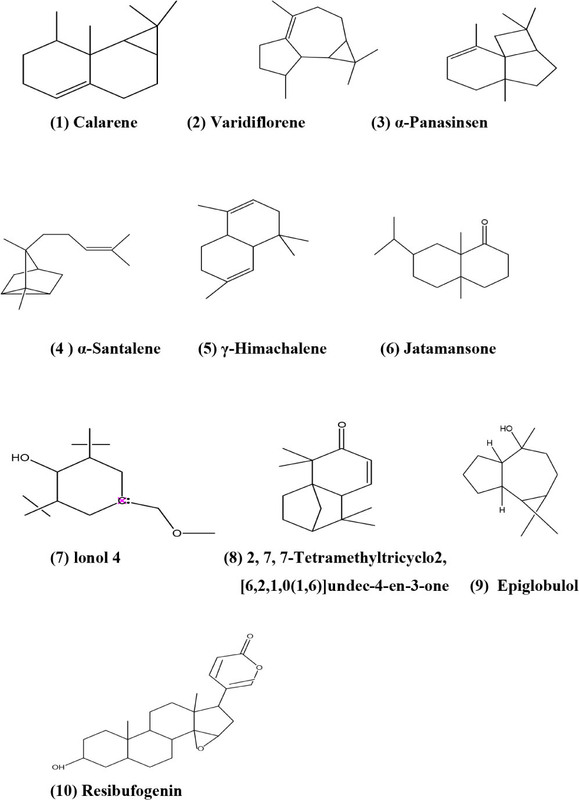 Chemical composition of volatile constituents of Nardostachys jatamansi Rhizomes. 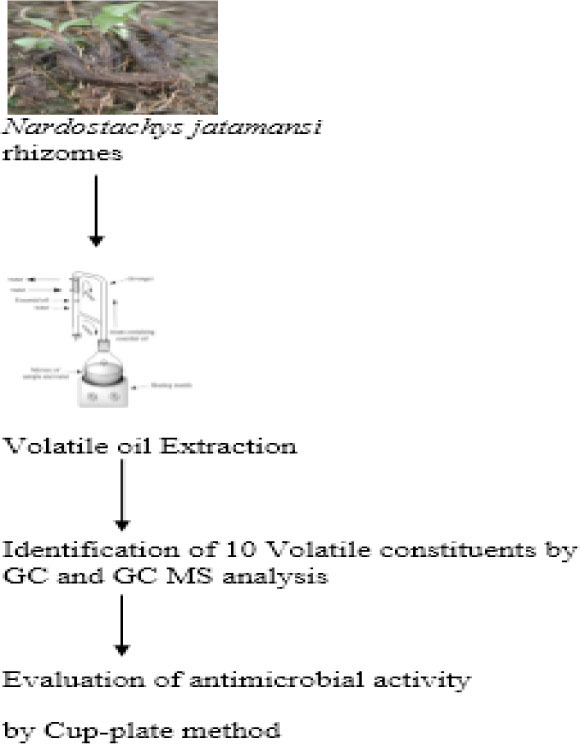 Antimicrobial activity of Nardostachys jatamansi volatile oil. Nardostachys jatamansi roots and Rhizomes. Mass fragmentation analysis of volatile constituents of Nardostachys jatamansi Rhizomes. Name/ Mol. For./ Mol. Wt. 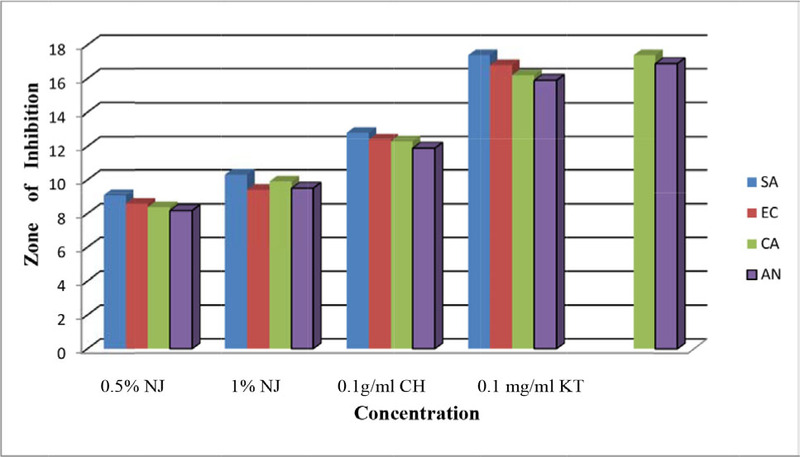 Antimicrobial activity of various concentrations of Nardostachys jatamansi volatile oil. * Triplicate Mean ± SEM is taken (n=3). The present study involves identication of total ten volatile constituents. The antibacterial activity shows the highest activity for 1% v/v concentration against Staphylococcus aureus and minimal towards Escherichia coli. While maximum antifungal activity was observed with 1% v/v concentration for Candida albicans and minimum for Aspergillus niger. Further study is required to isolate, identify and elucidate structures of these compounds. The Authors are thankful to Sh. P.K.Gupta, Chancellor and Sh. Y.K. Gupta Pro-Chancellor, Sharda University for their support. The Authors are also thankful to Dr. Robin Kumar, Principal Scientific Officer Indian Pharmacopoeial Commission, Ghaziabad for GC and GC-MS analysis. Conflicts of interest CONFLICTS OF INTEREST The authors declare no conflicts of interest. ‹ Maltase Inhibitory Activity of Aqueous Extracts of <italic>Zingiber officinale</italic> Rosc. and <italic>Trigonella foenum-graecum</italic> Linn.